Just Jingle: What's on Your Workspace FLOOR Wednesday!!! It's Wednesday and I am finally just getting back into the swing of things. I tend to want Christmas to last forever, so sometimes it's a bit tricky getting back to the routine, but, alas, here we are...ready for the next adventure! Okay, so I'm kind of excited about this one...It's WOYWW and I have some GREAT news! This is the floor BESIDE my desk - on the adhesives side! This is the floor BESIDE my desk - on the other side! And THIS! 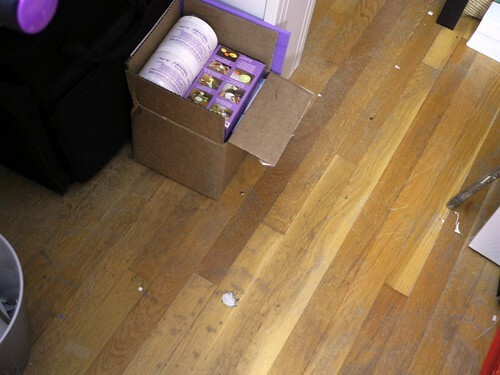 Well, this is the main portion of the floor between my desk and the small Expedit unit where I keep my Cricut and my Mac. I'm particularly proud of this one. So, my dear friends, it seems I'm back! I'm ready for the new year and I am ready for new adventures! Oh...speaking of new adventures, you should really check out the Amazing Mold Putty blog! 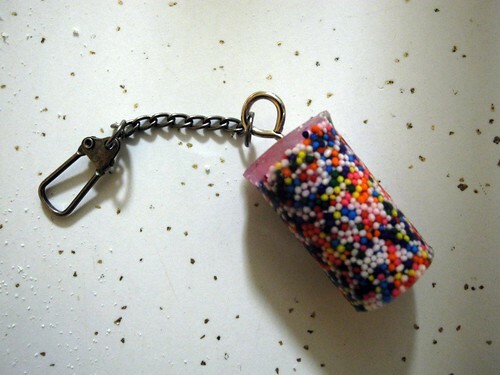 I posted a fun tutorial for this little sprinkles key chain. If you haven't tried working with molds and resins yet, you totally should! It's way easier than it looks and super fantasticly fun!!! 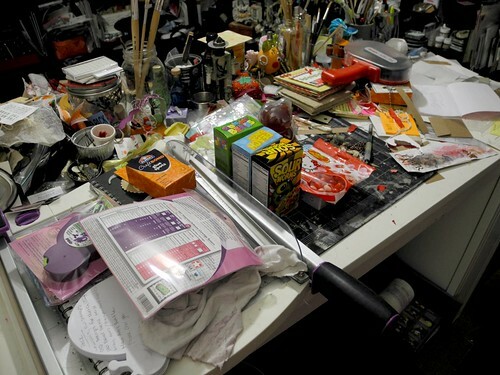 Gee Jennifer, and I'm such a fan of your messy art room!!! LOL. Big congrats on the floor! I can relate as the piles on mine are slowly finding their way into cupboards, and baskets and 'their spots'! Eventually it will all go back to normal, LOL, but what a great way to start the New Year! Congrats! It is a fussy job!! Happy New Year to you! Always love your posts! OOOOOOOH! You were SERIOUSLY on a straightening spree! Room looks super! Wish I could say the same for mine. Looks like a Houston hurricane hit it! But I don't mind as long as it's because I'm in the midst of a creative period! And I'm a HUGE fan of the Amazing Putty!!! ADDICTIVE! Your keychain totally rocks! Now I'm off to mess up my craft room some more! HUGS! 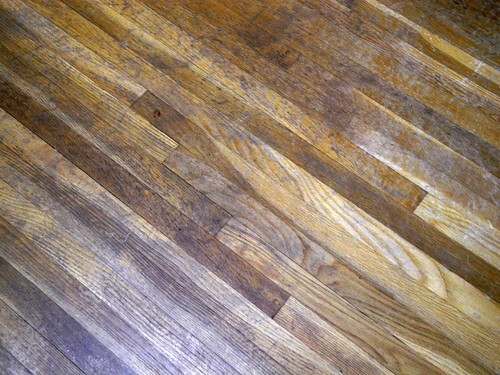 Love your wood floor. And that key chain is super creative. 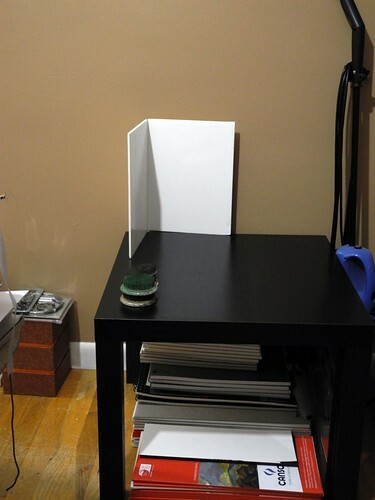 looks like a fun workspace! My goal today is to find my floor so thanks for the inspiration! Your keychain is so fun! Love it! I love it. It looks as if you have certainly been busy and creating up a storm! Your keychain is adorable! I would have to refrain myself from licking it. I know how good that feels. Rock on, girl! I can rarely see mine, when the desk is tidy the floor is bad and vice versa. I do have a little path out of the room, I mean I do need an escape route..
Hope you have had a wonderful xmas and wishing you a great 2012.
what a fun keychain...love it..
Don't you just love wood floors? 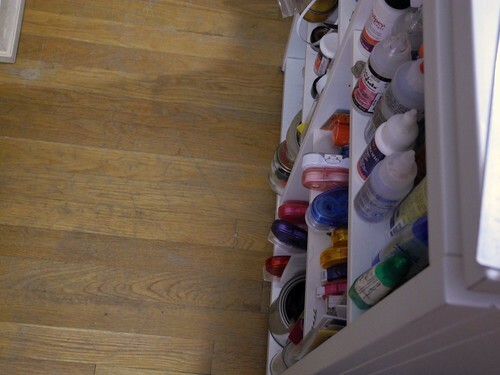 I love your craft room because it looks like lots of fun stuff... Have fun. what a fantastic keychain, Jingle! and congrats on the clean room! I have to start clearing mine out as the hubby is making over the room for me as my Christmas gift - so excited!!! LOL! 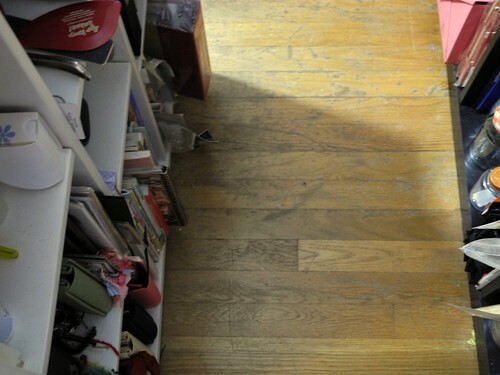 I think all of us have wondered at one time or another where our floor is, and if we're ever going to find it again. LOL! Congratulations on regaining your floor space! I am now sufferng from Floor Envy! But I do have good reason as I have a new drawer unit :-) I will show you all next week. did you know your woywwer link goes straight back to JD? Been waiting on you to fix your link..just sayin ;) I also took a picture from the floor view, but mine isn't cleanned up, yours is much better! lol happy New Years from North Carolina! Whoa! A floor! I'm a big floor piler too, so I understand the excitement of finding the floor again too. I don't dare leave things on the floor too long as invariably a cat will decide a pile is an excellent place for a hairball. ICK! Your posts always make me smile - THANKS!!! Well, I don't know which I like best, the cleared floor, and your revelling in it...or the 'adhesives side' of your desk, I need to get me another side to my desk!! There you are fit and ready for 2012, I wish you nothing but good things. You have a lovely floor. Now hurry and mess it up! How much can I thank you for this post? I have EXACTLY the same problem right now and I keep battling my battle against messy only to go back and make MORE mess! My floor is clear right about now- but only for a little bit of time. At least I know I'm not alone. Loved this post! You made me laugh. Loved this sprinkled piece, so sweet!